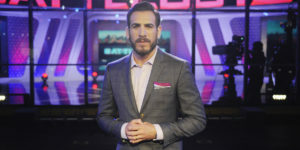 Kenny Florian is the new host of BattleBots, the TV show that features fights between remote-controlled robots. He’ll be joined by co-hosts Molly McGrath (America’s Pregame on Fox Sports 1) and Chris Rose (MLB Network’s Intentional Talk). Judges include Star Wars visual effects/model maker Fon Davis, Jessica Chobot (Nerdist), and NASA astronaut Leland Melvin. Florian is a great choice for commentary. He knows a thing or two about fighting. He’s a retired mixed martial artist who competed in the Ultimate Fighting Championship. The 39-year-old from Boston is also a color commentator for UFC Fight Night, and is the UFC on Fox analyst. BattleBots airs Sundays at 9pm on ABC.